Cape Town — Just off the back of a four-city European tour, Sama award-winning electronic band GoodLuck return to perform for another packed Cape Town audience this March at Kirstenbosch Summer Sunset Concert series. The band, who have just launched their new music studio and headquarters have been looking forward to performing for their hometown crowd for a long time. "There is nothing quite like performing live to our Cape Town family. This is where we started out, this is where the magic lives," said vocalist Jules Harding. "We have an awesome live show planned for Kirstenbosch and without wanting to give too much away, it is going to be like no other GoodLuck gig you have seen before," said producer Ben Peters. Every Sunday throughout the summer season, intimate concerts are held at Kirstenbosch National Botanical Gardens where the whole family and friends can picnic and enjoy a bottle of wine and relish some of South Africa's best live music while the sun slips behind the beautiful Table Mountain range. The idyllic venue is well known for its iconic Sunday concerts on the lawn with some of the country's top acts as well an array of international artists who have performed at Kirstenbosch. GoodLuck join some of the world's biggest acts like Bonobo, Jungle, Bastille, Texas, Xavier Rudd, Angus & Julia Stone, Josh Groban and many of SA's top acts like Mi Casa, Matthew Mole to name a few. 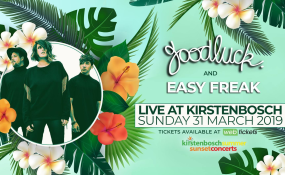 Book your tickets and join GoodLuck & Easy Freak in the most picturesque location in Cape Town on 31 March 2019, for what is going to be a summer sunset concert to remember. If you missed them in action last year, now's the time to make sure you don't miss out again on their signature live music and lighting celebration. Goodluck's show on Sunday will be the last in the series. Tickets can be bought from Webtickets. Gates to the concert area open at 16:00. All concerts take place irrespective of rain. Kirstenbosch cannot guarantee that tickets purchased from third parties will be valid.